Moves are afoot to open up out-of-bounds tourist destinations in the northeast of India and other border states to foreign visitors to boost India's tourism industry -- a major job creator that grew at over 15 percent last year. Union Tourism Minister K.J. 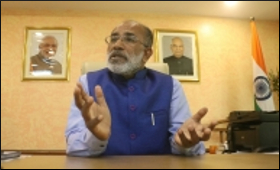 Alphons said the issue was now before the Union Home Ministry, which was likely to take a call on it soon. He also said the effort of the government was to move beyond the usual cliches about the country and market the "wisdom of India" and invite youth from all over the world to embark on a "journey of self-discovery" in this ancient land. "We have taken it up with the Home Ministry two years back and have been repeating the request to them, saying all these (remote) areas must be made accessible to tourists, subject to restrictions -- whatever you think are necessary. "I think the Home Ministry is in the process of doing that. That is the call the Home Ministry has to take, but I think they are pretty open to the whole idea. I hope we will hear good news about that soon," Alphons told IANS in an interview. He was replying to a question if the government would make far-flung picturesque places, including Arunachal Pradesh, Manipur, Mizoram, Nagaland and Sikkim, and parts of Himachal Pradesh, Jammu and Kashmir, Rajasthan and Uttarakhand, accessible to foreign tourists. In a wide-ranging interview at his office in Paryavaran Bhavan, the civil servant-turned-politician said the government's "huge focus" on the Northeast and other Himalayan states would boost the Indian tourism industry -- currently the seventh-largest in the world and tipped to be the third-largest travel economy by 2028. He said despite negative travel advisories, the Indian tourism industry was still doing pretty well. "The year 2017 was very good, with 10.2 million foreign tourist arrivals, which is an increase of 15.8 per cent from the last year. The global rate of growth is only five per cent. "Receipt of these foreign tourists was $27 billion That is an increase of 20.2 per cent in terms of revenue. "And domestically, 7.8 million travels were made last year. As such, a large part of our focus also goes to domestic tourism. In a country of 1.2 billion people, it can spin huge growth, it can generate incredible amounts of revenue." "We want to double the number of foreign tourist arrivals and double their receipts in three years. We want to double domestic tourist trips in three years and we think all this is possible." The number may appear staggering but is not over-optimistic, he said. According to the 2018 economic impact report by World Travel and Tourism Council, India is all set to establish itself as the third-largest travel and tourism economy by 2028. The country, according to the report, will add nearly 10 million jobs in the tourism sector by 2028 and the total number of jobs dependent directly or indirectly on the travel and tourism industry will increase from 42 million in 2018 to over 52 million in 2028. The minister said it was still a conservative estimate going by the "incredible possibilities" the tourism sector has. "One of our biggest focuses is the Northeast. All the states in the region have potential and we will work on them. We are working on adventure tourism. You see, 70 per cent of the Himalayas is in India. And we do not need much investment for para-gliding, river-rafting, trekking, cycling in the entire range -- from Kashmir to the Northeast, through Uttarakhand and Himachal Pradesh." The government, he said, was no longer selling only monuments, food, culture or natural beauty of a country with a 5,000-year-old civilisation. "What is this civilisation? Is it just about the monuments, food, culture, people, heritage? No. We have condensed this entire 5,000-year-old India and its legacies into yoga, into ayurveda, into the wisdom of India. We are marketing the wisdom of India." And the target, he said, were "young, enthusiastic, hyper-active millennials" across the world. "We thought yoga was for old people. But no. Here is a guy who is a hyper-active motorcycle racer looking for peace of mind. So we are saying, this is India's wisdom. Come and embark on the journey of self-discovery, find yourself with the wisdom of India," Alphonse said, showing a new one-minute "Incredible India" TV commercial titled "The Yogi of the Racetrack". The short film was released in Europe on February 23 and the minister said "it has attracted an incredible response with 20 million views in the first 20 days of its release". He admitted that the country, to realise its tourism dreams, needed "massive" infrastructure development. "Like improving connectivity, building hotels, restaurants. We are taking up these issues with various ministries and working in coordination with them. Like for road connectivity, I am taking it up with (Minister for Road Transport & Highways) Nitin Gadkari. For air connectivity, I will take it up with the Civil Aviation Ministry, and other issues with everybody else."